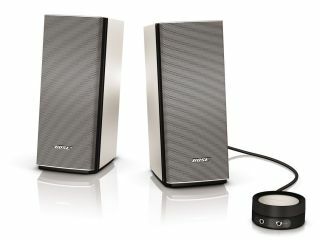 Bose has unveiled a new set of computer speakers, dubbed the Bose Companion 20, which claim to offer natural sound throughout the room, without the need for a separate subwoofer. The Companion 20 set brings with it a new driver and an advanced port that reproduces music across the full frequency range, which should deliver than natural sound. With Bose's proprietary electronics and amplification, Bose reckons you'll enjoy the deep low notes and volume levels of larger systems from the speakers that are around as deep as an iPhone 4 is long. The speakers may be small, but Bose's computer speaker product manager Lino Pucci says that this "doesn't compromise the audio quality or power it delivers." Coming with Bose TrueSpace stereo digital signal processing, the Companion 20 speakers apparently offer a wide and spacious sound even though they're intended to sit either side of a laptop or PC screen. The speakers also come with a small, circular control pod for easy-access volume and mute control, as well as a headphone jack and an input for portable music devices and smartphones. Available to buy from today in silver, the Bose Companion 20 UK price is set at around £199.